Facebook users are less satisfied with the social network than ever, while Google+ users are much happier, according to a new survey from the American Consumer Satisfaction Index (ASCI). ASCI measures consumer satisfaction for Internet social media annually, and this year the researchers added social networks Google+, Pinterest, Twitter, and LinkedIn. 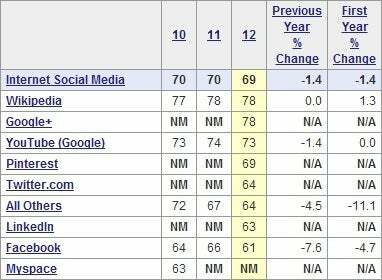 In the report, Google+ and Wikipedia tied for the best scores, each earning 78 points out of 100. Facebook, meanwhile, earned just 61 points--five points lower than last year's score, and the lowest satisfaction rating among Internet social media services. Survey respondents appreciated the lack of traditional advertising on Google+, and felt that the network's mobile apps were superior. Facebook's mobile apps are notoriously sluggish, but respondents mostly complained about changes to the site's user interface, including the new Timeline profile format. The bigger problem for Facebook, I think, is how low user satisfaction could affect the success of future services. Consider, for instance, the oft-rumored Facebook phone. If users are distrustful of Facebook, they may be reluctant to embrace such a product. Google may have a different problem: By forcing Google+ onto other products such as Search and Google Reader, the company may be harboring ill-will from users who aren't interested in the social network. It's unclear to what extent ASCI's scores account for that type of sentiment. Here's how the other new services measured up: Twitter and LinkedIn scored 64 points and 63 points, respectively, out of 100. Both of these scores were below the category average. Pinterest, on the other hand, matched the average social media score at 69 points. For the second year in a row, MySpace was not measured.